The 2006 Nobel Peace Prize Laureate, Muhammad Yunus, has given the go head for setting up the next Yunus Social Business Centre in Barcelona, a centre that will foster the creation of social companies –businesses created for the social good rather than for making private profit– which will be connected with the other 17 centres located around the world. Unlike the other centres scattered all over the world, the Yunus Social Business Centre de Barcelona will be the first to be run by a group of universities and business schools, one of which is EADA. All these institutions are once again ratifying their commitment to social entrepreneurship and bringing this alternative path for doing business, focused on transforming social needs, closer to students –undergraduate as well as master and postgraduate students. The new centre in Barcelona intends to fulfil a double objective. On the one hand, to create a space for research and knowledge creation around social entrepreneurship and the social economy. 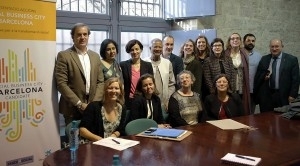 And secondly, to evaluate the activities carried out by Barcelona Social Business City, an initiative also backed by Muhammad Yunus and promoted by the Tandem Social consultancy, intended to lower unemployment among young people in the city of Barcelona by encouraging and backing social entrepreneurship among young people. This is a social burden which affects 35% of young Barcelonans aged 16 to 24. Yunus’s aim is to constitute a network of social cities around the world that will interchange knowhow and experiences. This ambitious project was presented a few weeks ago in Barcelona’s Palau de la Música Catalana, where various social entrepreneurship projects in Barcelona were announced and discussion ensued around the social company as a motor of social transformation. The event was attended by Ms Lamiya Morshed, executive director of the Yunus Centre in Dhaka, who explained that “all the centres that have been set up in recent years have maintained the spirit of the first, which was set up by the Nobel Prize laureate in Dhaka (Bangladesh), in other words, they address those problems that cannot be solved by the capitalist perspective”. In addition, she stressed the need “to connect all these centres located in different countries worldwide in order to make joint progress in promoting social companies and, more specifically, to raise awareness among young entrepreneurs that there is an alternative to traditional entrepreneurship”. Ms Morshed highlighted the social impact of numerous initiatives carried out in all of these centres. As an example, she mentioned the Dhaka Yunus Social Business Centre’s new entrepreneurs programme, which in recent years has provided funding to 300 entrepreneurs to set up their own business. Another very good example is the success of social company forums, which are attended by organisations from around the world where they present real figures on the social initiatives they are implementing. In 2015, these forums brought together 1,800 people from 30 countries. She also mentioned the Global Social Business Summit, the biggest international platform for social businesses, bringing together social, economic and political stakeholders. The last Summit was held in 2015 in Berlin and was attended by over 1,000 participants more than 70 countries. Undoubtedly, the most awaited presentation was that given by Muhammad Yunus himself, who defined himself as “a social problems solver”. The Nobel Prize laureate explained the motives that prompted him to set up Grameen Bank in Dhaka in 1993, more popularly known as the poor people’s bank: “I realised that banking institutions only financed entrepreneurship projects for people with economic means. The priority, however, were poor people, who despite having very good ideas for businesses, were denied credit. I even spoke with various bank managers asking them to help these people, but it was totally useless because the capitalist system isn’t intended for the poor”. And that’s how Yunus began lending money to people who wanted to start a business. “You will pay me back when you can,” he would say to them. As more and more people showed an interest, he thought about setting up a bank that extended non-interest loans and financed social projects that would solve three big problems: poverty, unemployment (high unemployment rates make entrepreneurship harder) and preservation of the environment. Today Grameen Bank is located in the same building as the Yunus Social Business Centre of Dhaka. Mr Yunus also stressed the responsibility we all have to change the world. He laid special emphasis on young people “who are too engaged with new technologies without thinking about the uses they may have for promoting social actions”. He also stated that “we are very much concerned about looking for work and very little about creating social companies, which would help to provide jobs to many people without resources”. Now is the moment he said to create these types of companies, “and I will be your main shareholder”.